Alan Jones is a traditional Jazz musician and a founder member of the Adamant Jazz band, a New Orleans style Traditional Jazz band. The bit I know about is the traditional New Orleans style of jazz in Cardiff which started with Mike Harries. He had a band in the 40's and 50's and is in fact still going. He was a forerunner to all the other local bands in Cardiff. Mike used to play in the Philharmonic and then Number 7 High Street, which was the old Mavis June school of dancing, which was basically a cellar. It was dry so there was no alcohol. At the time (1958) it was the in thing and the queues were tremendous, like a pop concert these days, but it was traditional Jazz. People loved it. The interval would come and everyone would rush around the old Arcade for a couple of pints and then come back for the second half. That carried on for several years. Mike Harries' was the fore- most band in Cardiff at the time, there was another band called the Castle City Jazz band and then there was a smaller band called the Saratoga which Jeff and I were in. We then formed out of this lot, the Adamant marching band which was a name that came out of a urinal in the Rummer Tavern. A lot of the toilets in Cardiff were called Adamant. That is where the name came from anyway. The adamant band was, and still is, a New Orleans Marching band. We are playing actually on Friday. We play anywhere really, the Brecon Jazz festivals and when we started we used to do a lot of charity work in Cardiff for Cheshire Homes and that sort of thing. It was an excuse to have a blow and march around Cardiff. It was great and entertained the crowd. Going back to the Mike Harries thing we went from the Mavis June place to the Estonia club on Charles Street. I don't know what it is now but it used to be the Old Oriel Bookshop, anyway that was another Mecca for Jazz. Again Mike Harries was the organiser of these events. In parallel to Mike's band the Icon band was formed, in 1968, and that was based in the Quebec hotel in the Bay- which is now long gone, and we were there for ages, until the mid 70's. It used to be packed like sardines in there. From there we went to the Great Western in the cellar bar. It used to be packed, you wouldn't believe it there used to be a couple of 100 people there every time we played. There was also the Ghana club for Jazz in Bute Street but we weren't associated with them. There were other styles of jazz happening in Cardiff at that time. The trad jazz went to the GW's. Club Ifor Bach also used to have the Middle 8 Jazz club back in the 70's. That was a more mainstream style of jazz. All the different styles of Jazz got on together. The Icon then were in the Western until the late 70's then we moved to the Four Bars Inn which is now Dempsey's. We were there for another 10 years and at that time the Welsh Jazz society were around doing a presentation but they didn't seem to cater for our type of music. We would be there on the Sunday night then all the rest of the week was modern or mainstream jazz. So in 1989 we formed the preservation Jazz society which is now based Café Jazz on St Mary's Street Every Tuesday. That started down the Old Sea Lock in the bay, which was roughly where Harry Ramsdens is, we formed a group there and would have meetings and invite guest bands. So the preservation Jazz society has been keeping Jazz live in the town centre for the last 10 or 15 years. 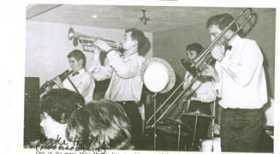 The Icon Band and the Riverside Band, which has now gone, have been around playing traditional jazz since 1968. There was also the Acme band from Newport. Mike Harry is now semi- retired. His predecessor was the Midnight Special. So that basically in a nutshell is the history of Jazz in Cardiff.